These were not in any way what I had originally intended to make. I was weirdly thinking about bananas, so that part still came to fruitition (get it? FRUITition? Waka wakka waka. You know you love it 😉 ), but I was actually initially intending some kind of banana bread-esque thing with icing. But then I started thinking about other things that go with banana (like peanut butter of course, but I know I’ve done that a lot lately, so how about we sub that out for some cookie butter instead??!!! You said it Amber! You’re a genius….and so modest). Then, as I was in the midst of bringing the batter together, I thought to myself “these just need something more, like, some crumble topping or something.” I mean who doesn’t love crumble topping? Why is that not a cereal flavour? Sure, you might be thinking to yourself “but Amber, crumble has so much sugar in it, and I know it can have oatmeal in it too, but should you really be having that much sugar in your cereal?”. I submit for you, exhibit A….Cookie Crisp cereal. I mean, those people aren’t even trying. They just threw their collective hands in the air and said “F*#k it, we’re doing this. Let’s not sugar coat it any longer (or extra sugar coat it? ), I mean, who’s kidding who here? If people want cookies for breakfast, I say, just have cookies for breakfast.” If you really want to see a fun rant on this topic, check out this little Seinfeld stand up routine about it. Is anyone else starting to think that these should just straight up be in the cookie/ snack aisle? I don’t really think it even qualifies as cereal anymore. 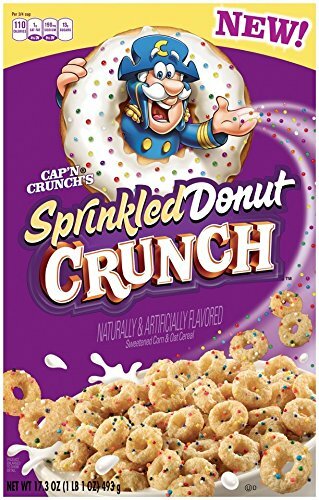 Just because you’re pouring milk (or non-dairy milk) over it, does not a cereal make (otherwise any soufflé or brownie that you opt to pour “crème anglaise” over would now have to be included in the “breakfast cereal” category). 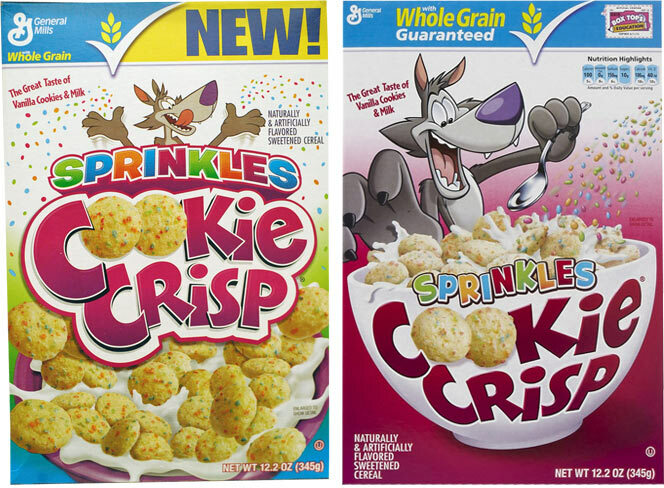 The most hilarious part of this whole thing to me though is at least these cereals are being honest. Cookie Crisp actually has a similar sugar percentage as the seemingly healthy Raisin Bran, Honey Nut Cheerios and Special K Fruit and Yogurt. So really what I’m saying is, you might as well eat cookies for breakfast 😉 . Now that I’ve gone completely off track let’s bring myself back to these bars shall we? So this crumble I’m talking about, some people put nuts in their crumble (which totally rocks my world too), but, since I already wasn’t going to have any nuts in this, I thought I’d try something a little different, and extra amp up my banana flavour. Replace nuts with coarsely chopped banana chips! Seriously a good idea. If you’re ever just making crumble for something else, feel free to use this tip. I actually did two half recipes of these because I wanted to do a test of making a gluten free version (being the genius that I am, I completely blanked on the fact that cookie butter is not exactly gluten free. I believe the first ingredient is actually wheat. *forehead slap*. So these won’t be truly gluten free unless you swap the cookie butter for a nut or seed butter of your choice). Strangely enough, the gluten free one actually turned out better. Although I mostly think this is because I did the “regular” version first and I think I left them in the oven too long. Because of that, I opted to put my “gluten free” (yeah for appropriate usage of quotes!!!!) version in for 5 minutes less time…so I think that had something to do with it. If you make these, definitely remove them even if you don’t think they’re done. The top will still look a little liquidy, but that’s OK, it’ll finish setting up as it cools, I promise! (I mean, don’t take it out of the oven after 30 seconds or anything, that’s ridiculous and all guarantees are null and void if you’re just trying to be a jerk about the whole thing. I know you want to get on eating these stat, but you’ve got to at least give it some lovin’ in the oven). If you opt to make these, let me know if you decide to just go totally bananas and eat them for breakfast. Melt butter in the microwave, then pour into a large mixing bowl. Add the egg replacer, brown sugar, vanilla, maple, cinnamon and nutmeg, and whisk until smooth. Add the Cookie Butter, and stir to incorporate. Pour the flour/banana chip mixture into your liquid and stir just until combined – don’t overmix. Pour batter into prepared baking dish, smoothing the top lightly with a spatula or back of a spoon. In a medium sized mixing bowl, add all the streusel ingredients except the cookie butter and work the mixture with a spoon, or your hands until mixed together and crumbly. Sprinkle topping evenly over your bars. Bake for about 35-40 minutes. The center might still look a bit liquidy, but don’t worry about that. Once the edges are slightly browning, remove from the oven, it’ll finish setting up as it cools (unless you want crunchier bars, but trust me, they’re better softer and chewier). Allow bars to cool in baking dish before slicing. Store bars at room temperature in an airtight container (they freeze well as well).